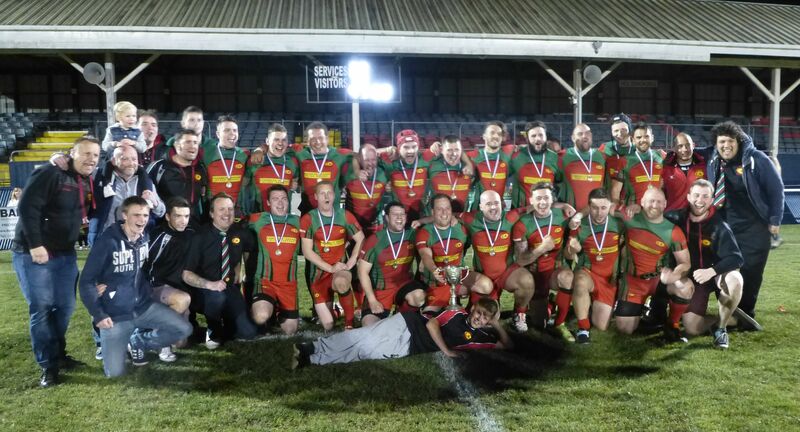 TAMAR SARACENS produced a dominant display to beat Saltash IIs 37-10 and claim the RNEC Cup at the Rectory on Wednesday night. The Devon Two runners-up had found themselves behind after just 66 seconds when Shaun Branwell crossed for Saltash and Nick Blake converted. But that was about as good as it got for the Moorlands Lane side, who spend much of the match defending. Sarries were held up over the line three times and knock-on over it before the try they threatened finally came in the 16th minute, with fly-half Scott Sheldon showing good strength to hold off a tackle and stretch out to touch down. He surprisingly missed the conversion next to the posts, but eight minutes later Saracens got a second try courtesy of Dean Oram. Despite being out-played for much of the half, Saltash, whose side included veteran stars Richard Thompson and Peter Congo, went in at the break on level terms thanks to a Blake penalty. The second period, though, belonged totally to Tamar Saracens with number eight Aaron Webb, Ty Colwill, Chris Cox and Jamie Lavill-Harris adding further tries. In the Pedric Cup, Devonport Services IIIs snatched victory at the death against Plymstock Albion Oaks IIs. Oaks led 14-9 with just three minutes to go, but Services ended up winning 23-14. Services had been second best in the first period and trailed 14-3 with only a Mark Symes penalty to show for their efforts. Symes kicked another penalty after the break to make it 14-6, which was how it stayed until the 70th minute when he added a third penalty to put his side within a try of winning. That try came in the 77th minute when replacement Joe McKinley crossed on the far left. Yet it left Symes with a tough conversion. He knew if he missed it and the match finished at 14-14 then Oaks would win on tries scored, but he brilliantly converted. However, there was still time for Services to score another try courtesy of Shady Lane, which Symes converted. Tags: Plymouth, Rugby. Bookmark the permalink.